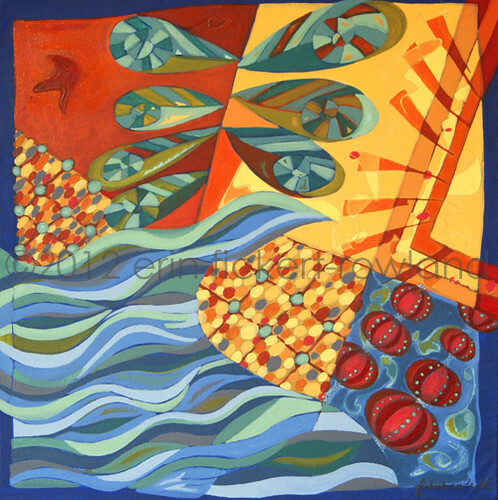 This series of three paintings is centered on the theme of the Water Cycle. Like the air we breathe, water is essential to all life on our planet. It rains down, is intercepted by plant life, flows down through the ground and returns to the sea, where it evaporates back to the sky. Rendered in a richly colored abstract and primitive style, these pieces look wonderful displayed together, but are also beautiful on their own. 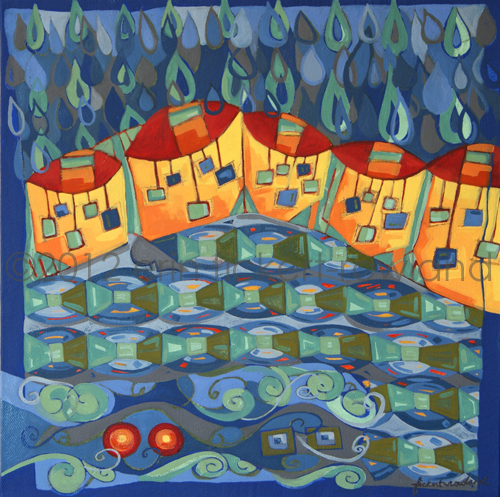 Whimsical houses line up in a row, with red rooftops that appear to dance under rain falling from the sky. Square windows swing on the sides of the houses, while the teal rain trickles down to the streets below. The street has been rendered in a way to suggest manhole covers that lead to the sewers below. The radiant heat of the sun moves across the sky over the swirling waves of the ocean, and the urchin filled beach. Hot colors of orange, yellow and magenta have been meticulously layered to create a feeling of abundant sand and shells. 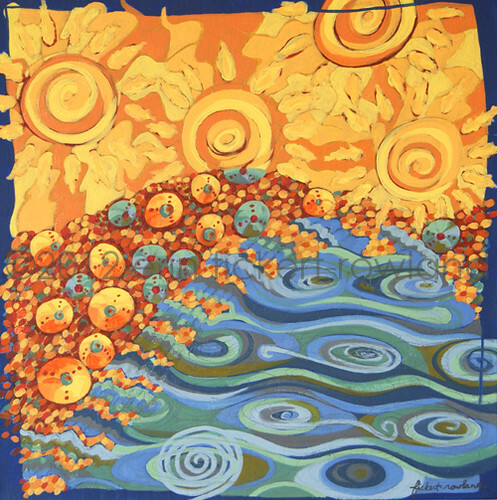 The repeated design of swirls throughout the composition creates a feeling of motion in the sun and sea. "Canopy Interception and Streamflow Return"
Plants catch the water that falls in precipitation from the sky, absorb it, and eventually evaporate it back into the atmosphere. The spiraling leaves in this painting suggest the work that they conduct. Water that reaches the ground which travels into the streams and rivers, eventually makes its way back out to sea, where it becomes a part of the water cycle once again. That journey is depicted in this composition by the rising wave of rippling water, which points to the sea urchins back in the ocean. at Zip 37 Gallery in Denver, June 7-23rd. They are available for sale in the gallery, or online in my Etsy shop. I love the series as a series very much. But if i had to choose just one - it would be open water evaporation. There is such a feeling of life and happiness. You HAVE been working hard in the studio, haven't you! Thank you so much for your kind compliment, Pam! Yes- I keep myself very busy, indeed! I love these! Especially the first two. I love the patterns within everything and the great colors. Of your work I've seen in the past year, I think these are my favorites!